The McNulty Schoolhouse was three miles south and three miles east of the town of Meade. The borders of District No. 3 changed slightly over the years, but the school itself was always located in the SW/4 of the SW/4 Sec. 21-T32-R37, Meade Center Township. 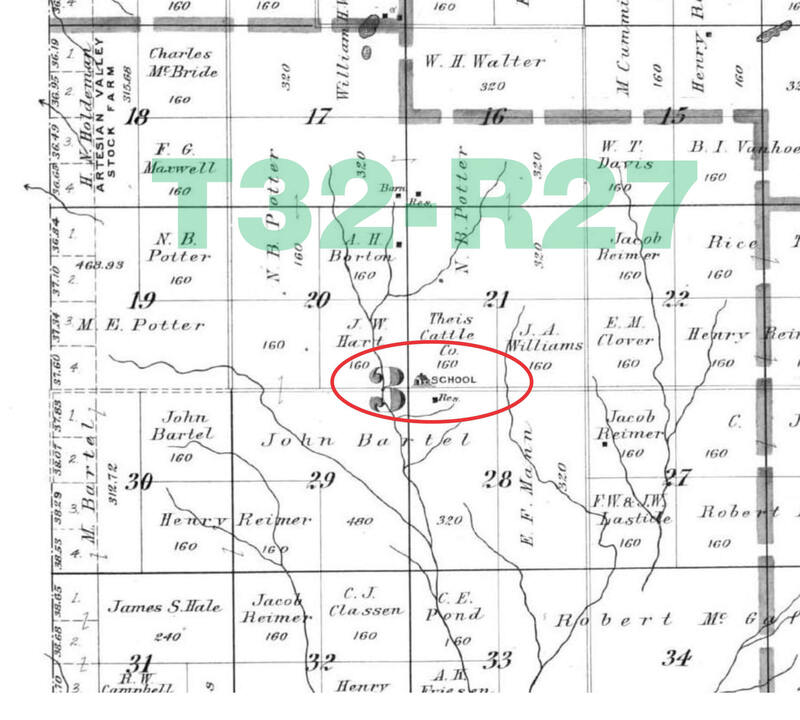 McNulty began as a subscription school in 1887, and was originally conducted in a sod house on land that was first homesteaded by Henry H. Budgett, and later owned by the Theis Cattle Co. We don't know where the name of McNulty originated. 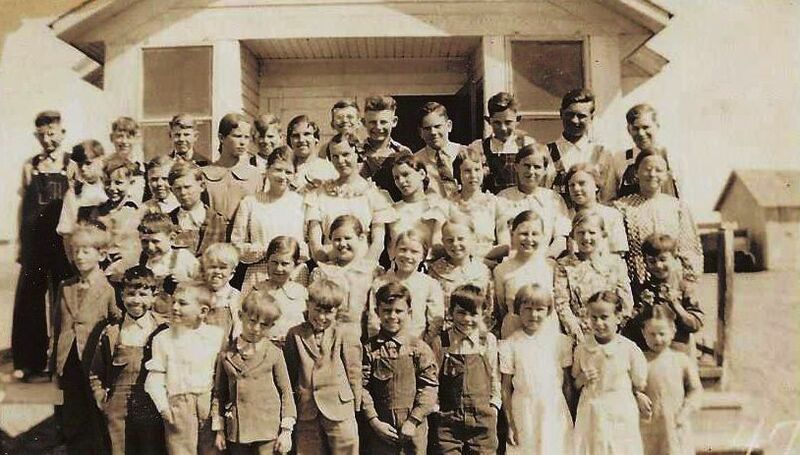 Many times schools were called by the name of the family that had the most children in attendance. The only place we have found the McNulty name is in an article about the Catholic church in Meade in which they were listing members in 1886. The school kept that name up to 1946, at which time it became part of District No. 73, and the name still remained until the school finally closed in 1953. Picture at left is the McNulty School 1918-19. This would have been the last class in this original building. This original frame building was sold to Henry B. Friesen for $305.00 in May, 1919, and moved to his farm. The school house in District No. 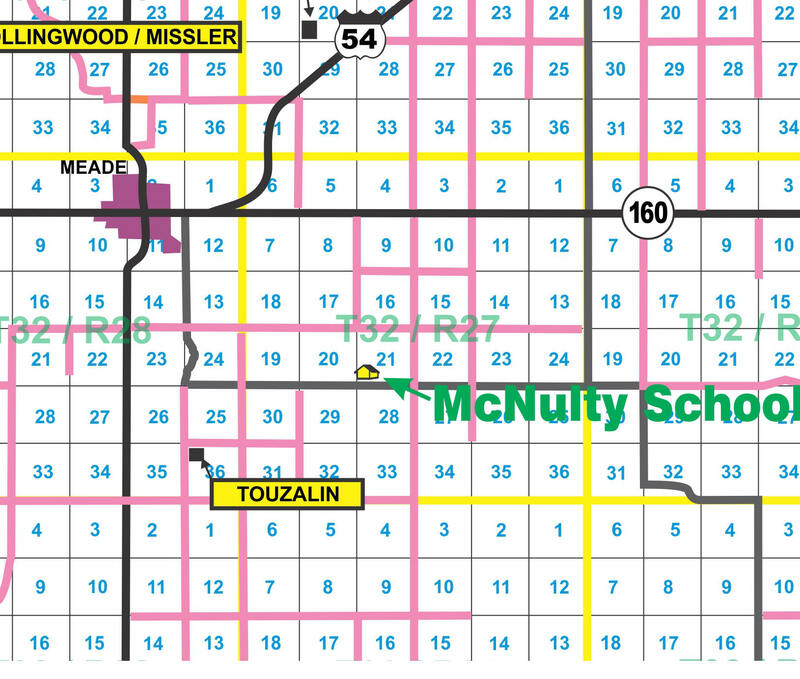 3, three miles south and three miles east of Meade, better know to early settlers as the McNulty school was sold last Monday to the highest bidder. Mr. Henry B. Friesen gets the building, the price paid being $305.00. He will move it to his farm and convert it into a dwelling. the new building, modern in every way, will be completed in its place by time for the beginning of school next year. An interesting bit of history centers around this old landmark, which is among the oldest in the county. Previous to its erection a "soddie" about 12 x 20 feet served as a school house. 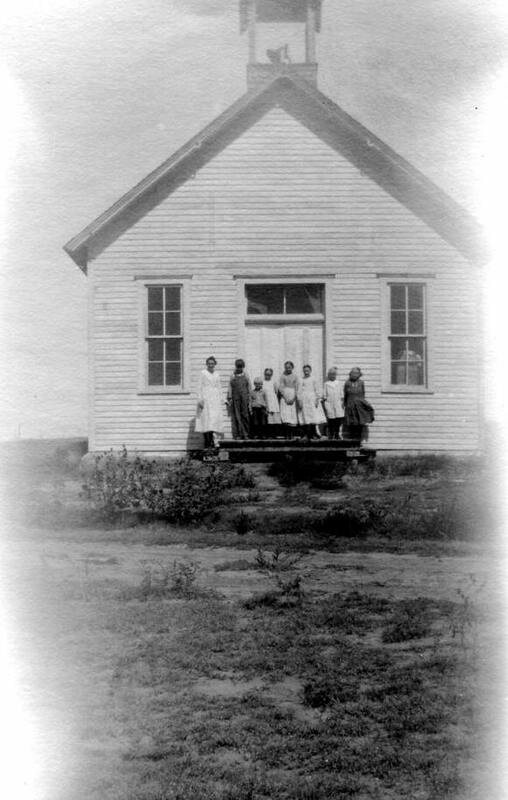 During the Christmas holidays of 1887, under the direction of Miss Constance Roberts, now deceased, the Cantata, "Little Red Riding Hood" was given in the sod house, at the conclusion of which subscriptions for a new building were taken. The proceeds from the entertainment were also donated toward the new school house. 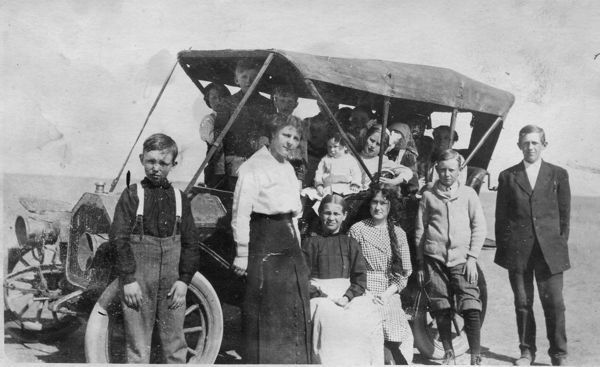 Old timers relate that a number of people from Meade attended the entertainment, having been taken there in a stage coach in use in those days. The building was far too small to accommodate the crowd, and it was suggested by some that they take the side out of the soddie, that those who were compelled to remain outside might see the entertainment. This, however, was not done. In the spring of 1888, the building which was sold last Monday was completed, and in the fall of the same year Mrs. J.E. Roberts of this city taught the first term in the new building. Some very elaborate ceremonies for those times where held when the new structure was dedicated, R.M. Painter of this city and Willis G. Emerson, deceased, making two very eloquent addresses. 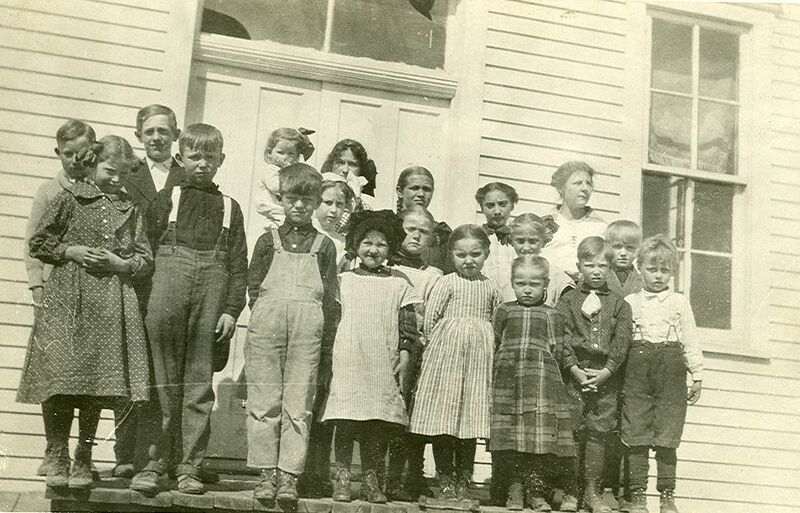 When the Mennonites started arriving in Meade County around 1906, they settled in and around the McNulty school district, providing an endless number of fresh young minds to be educated at this school. In July of 1983, they had a McNulty School reunion at the Emmanuel Mennonite Church and had 185 former pupils in attendance. McNulty class of 1935-36. These students are named here. McNulty students. Left, Henry Friesen, right, John Bartel, Agnes Bartel next to the teacher next Helen Borton. Teacher, Frances Ziegelmeyer. 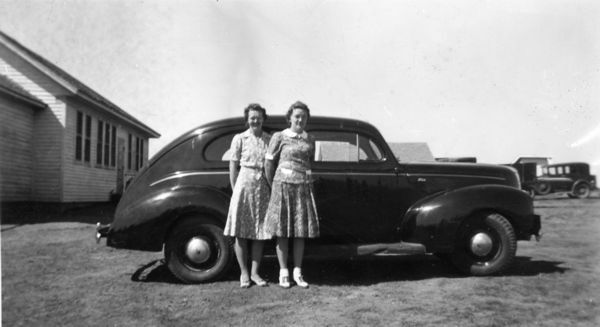 Mary and Esther Willems, McNulty teachers.